If you manage to make that perceived imposition and convince a friend to read your work, the battle isn’t over. Now you have to remind your beta reader(s) to get back to you about the piece in a reasonable amount of time. And then you have to force yourself to stick to that deadline because, since they are busy, you feel like you’re imposing even more if you try to hold them to the original date they agreed upon. If you do manage to call a late beta reader and remind them that they did agree to read your work by such-and-such a date and could you please let me know…the reaction I generally get is a flustered apology and the assurance that they are almost done and will have it to me by such-and-such a time. Sometimes I believe that they really are nearly done. Other times…I think they forgot about it and are trying to hide their embarrassment. Which in turn makes me feel embarrassed and I start worrying about being an imposition all over again. So, when you are a writer desperate for quality feedback on your writing, but suffering from too much guilt, what do you do? Accept that you are NOT an imposition. Really, you aren’t. You have friends and people you trust for a reason. Your work is worth something, YOU are worth something, and wanting quality feedback in a reasonable amount of time is a natural part of the writing process. Be polite and use common sense. If you know a friend is going to a wedding, teaching a class, and working two jobs, it probably isn’t the best time to ask them to critique your novel. Ask your friends or previous beta readers how they’re lives are going, what they are up to, and get a sense of how stressed they are. If you prefer the direct approach, ask them straight out if they have the time, energy, or interest to read your novel. If they seem stressed or reluctant to take the job, thank them and move on. Set a deadline! 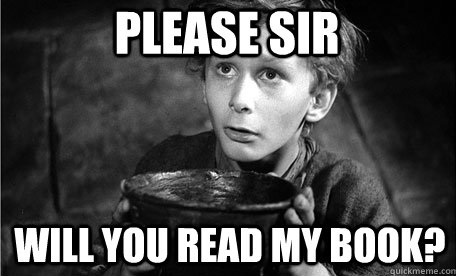 Let your beta reader(s) know up front when you need their feedback. Be willing to negotiate. If you have to have feedback by a date that doesn’t work for your beta, either change the deadline or find another beta who can meet it. Beta readers! Be sure to follow through! If you can’t read and critique a piece by the given deadline, you must either decline the job or call the writer as soon as you realize that you won’t be able to finish in time. Apologize and tell the writer when you will have the critique finished and then make that your priority. It’s only polite. Nothing shakes a writer’s confidence in a beta reader like one who constantly reschedules without results. Writers! Be sure to thank your betas! Always express gratitude to your beta reader(s) when they accept the job and follow through on reading and critiquing. Try to do something nice for your extra special betas who go above and beyond the call of duty.